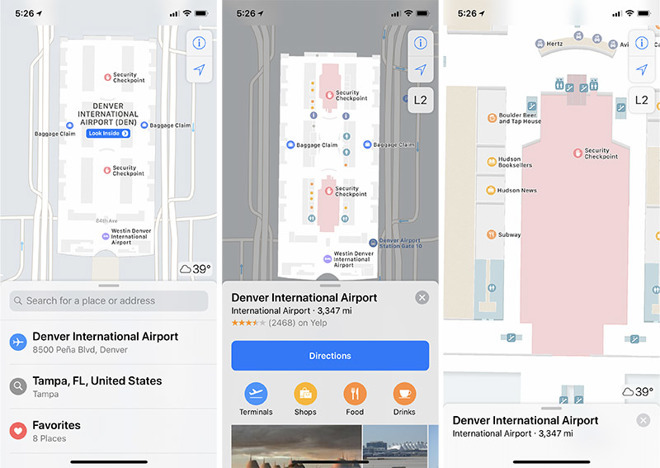 Included in an update to its iOS Feature Availability webpage, Apple names the 34 airports that currently boast indoor mapping support in iOS 11. As seen below, most airports are located in the U.S., but Apple does include a few major international hubs like Berlin Tegel and Vancouver International. Apple also include a short list of nine metro areas, all within the U.S., that house malls offering indoor mapping data. Currently, select shopping centers in Baltimore, Md., Boston, Mass., Chicago, Ill., Los Angeles, Calif., New York, N.Y., Philadelphia, Penn., San Francisco, Calif., San Jose, Calif., and Washington, DC are supported. Unfortunately, the update fails to specify which malls feature indoor data. The information is a welcome addition to Maps, as users can quickly navigate through multi-level complexes or large indoor facilities without referencing a website or physical guide. Apple's indoor maps feature an easy-to-use interface with bold iconography and text for popular landmarks and facilities. For example, airport maps include shaded areas indicating gates, restaurants, shops, security checkpoints and other points of interest. Malls incorporate similar signage for bathrooms and other common areas, while detailed floor plans provide store store layouts and directions. Users can also tap on a "Browse" section to search for stores by category. Tapping on a particular store brings up informational pages with hours, reviews and more. Apple is constantly updating its catalog of indoor maps locations. The most recent addition came in October when a few U.S. airports were added to the list.